Discover our collection of informative UX infographics, AI & machine learning infographics and more. your customers want you to leverage ai. are you ready? As machine learning continues to evolve, consumers are increasingly excited about the changes it will bring to our lives, work and world. Here are 6 key areas where they'd like to see it play a larger role, and where today's brands should be focusing their AI strategies. Despite the industry-wide buzz surrounding UX, many companies in the digital marketing and design space are still struggling to execute it successfully. The main reason? Although they know they need great usability, their investment in that area often falls far short. 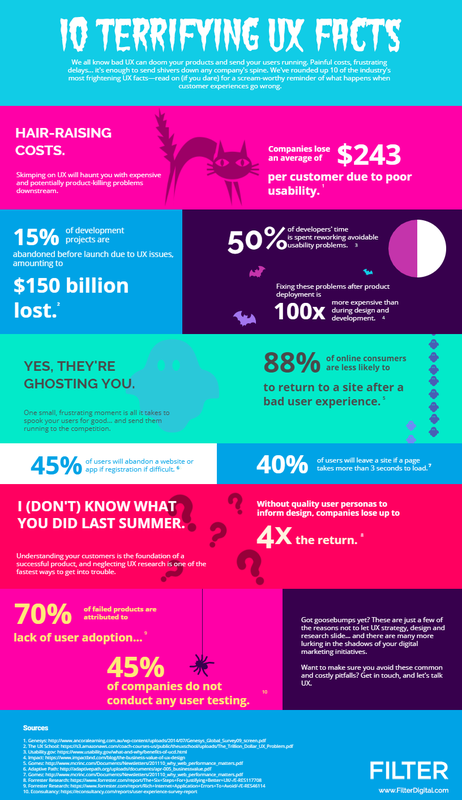 Failing to dedicate sufficient time, talent and overall attention to UX hurts companies on virtually every level—and in this infographic you’ll discover why. Please include attribution to www.filterdigital.com with this graphic.